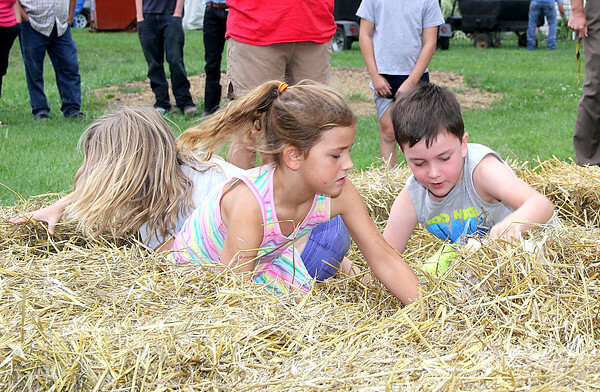 Mad Scramble: "Gold Diggers - Dash for Cash" participants (from left) Madelyn Hinton, 6, Samantha Dunshee, 7, and Andrew Butler, 7, attack the 14x10 foot area for gold $1 coins and candy during Family Day Tuesday morning at the 2016 Boone County 4-H Fair. Three age groups took part in the event, and had 30 seconds to sccop as many envelopes and as much candy as possible. First-year Family Day Coordinator Carey Roberts said they added candy this year to give the event extra appeal to the kids.